Are your surveys generating the right feedback? Like any non-profit, you aim to serve. Yet doing so can be difficult when you don’t know what your audience wants or needs. Thus: the user survey. It may seem like the answer to your prayers, but like anyone who has ever administered a survey can tell you, getting people to fill it out can be a disheartening endeavor. However, if you can find ways to improve your surveys (and thereby increase your responses), the results can be highly rewarding. 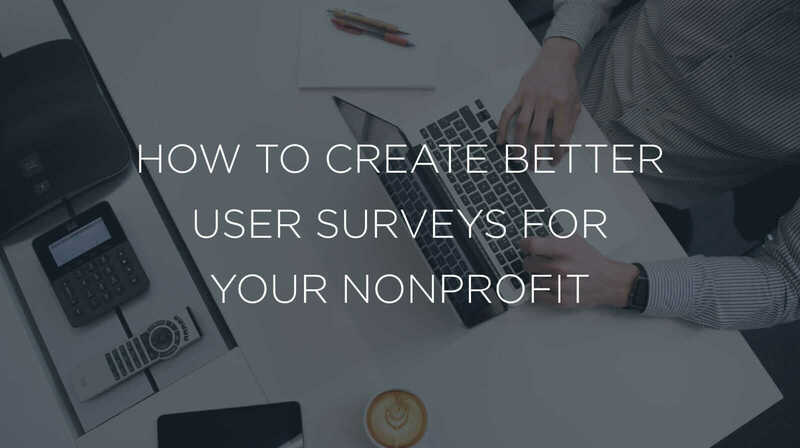 Surveys not only provide the feedback you need to improve your non-profit, they can also strengthen your community by making respondents feel involved. Not everyone will care enough to answer your questions. But those who do not only want to be part of your organization (even if only as a beneficiary), but will also feel gratified to see their responses put to use. So, to get the most out of your user surveys, try some of these tips. 1. Establish the purpose of your survey. Have a point. Know what you want to learn from your survey, and stick to it. A short, targeted survey is more likely to see a high response rate than a long and vague one. 2. Be mindful of your user’s time. No one wants to feel like you’re wasting their time. This is especially crucial for surveys, when your users area already going out of their way to help you. They are doing you a favor by responding, so make sure you treat it as such. After all, there’s nothing worse than a pushy survey trying to guilt respondents into giving answers. Also, don’t fall into the trap of thinking that five minutes isn’t a big ask. After all, how long does it take you to skip an ad on YouTube? Most of those are about fifteen to thirty seconds long, but we’re all hovering over the “skip” button, waiting for the first opportunity to click away. Now apply the impatience users feel over a ten-second delay to your survey, and remember: you’re asking for a favor. Don’t press your luck. 3. Focus on closed question types. Most survey questions can be split into two groups: open and closed questions. An open question is the type you might find in an interview. “Tell me about your experience,” it might say, or “how do you feel about our services.” Open questions can prompt a lot of highly valuable details, and that makes them wonderful. But they also take a lot of time to answer, which can be a stumbling block. Furthermore, many questions are phrased as open when they could be turned into simple yes/no questions. Other closed questions include multiple choice or “rate on a scale” questions. Users can answer these much more quickly, which will lead to a higher response rate. A good example of this is the HappyOrNot survey terminals that have cropped up in places like airplane terminals. They may generate only basic data feedback, but the high response rate can transform industries. 4. Plan your timing carefully. You want to catch your users when their interest is fresh. But if you have to send a survey unprompted, take a little extra time to inform your users about why this information is so important for your organization. The explanation will do a lot to inspire your user’s interest. 5. Don’t turn every question into a required field. Remember those open questions we were talking about? There may be times when you want to include them on your survey, even though you know they’ll take longer for your users to answer. Here’s the trick: don’t make them required fields. So many non-profits become so absorbed in the importance of their questions that they turn every question into a requirement. Here’s the thing, though: if your users have a good response, they’ll answer that question even if it isn’t required. And if they don’t have a good response? Well, that won’t help you anyway. Focus on the information that is actually crucial for you to process the form, and don’t make anything else a requirement. 6. Consider publishing the results. Finally, there is a huge value to transparency. If you’re asking your community for feedback, especially for upcoming events, programs, or services, it may work in your favor to publish your survey results where the community can see them. This not only demonstrates that you were listening to their feedback, it also helps forestall any complaints from those who didn’t see the results they wanted. Follow up your surveys with one more (small) request. Having someone fill out your survey is always a small victory. However, you get gain a little more from their participation if you plan your follow up carefully. When someone completes their survey, you should direct them to a thank-you page so they know their responses were received. Then, while you have their attention, make one final request. Maybe you can ask them to share the survey with a friend, or make a post about it on social media. Or you could tell them about your newsletter and ask them to subscribe. You could even ask them to make a small donation. It may seem counterintuitive to make yet another ask after they’ve already gone through the survey process, but there’s actually some sound reasoning behind it. For one, those who have completed your survey are already showing interest in your organization. After all, to have filled out a survey means they must care, even if only a little. But there’s another psychological reason behind the follow-up request, and it is this: having already devoted time to answering your questions, your user’s investment in your organization has reached a high. Their mind is focused on you, your mission, and why it is important to them. Once they leave the screen, their attention will return to their other daily tasks. So, using the “thank you” screen of your survey to make a small request is actually more likely to result in success than making that request at another time. You have your user’s attention. Don’t squander it.